changes in treatment recommendations for opiates and intravenous nitrates. The burden of heart failure remains considerable. Approximately 800,000 people in the UK have a diagnosis of heart failure, which accounts for 5% of all emergency hospital admissions and 2% of total bed days.1 It is even more striking that, for those patients admitted to hospital with heart failure and who survive to discharge, the 1-year mortality is approximately 25%.1 Treating people who become acutely unwell with heart failure may be difficult; the diagnosis is often challenging, the best way to structure care is not known, and within the UK there is significant variation in clinical practice. The recently published NICE Clinical Guideline (CG) 187 on Acute heart failure: diagnosing and managing acute heart failure in adults2, which has been awarded the NICE Accreditation Mark (see Box 1, below), aims to address these difficulties. Much of the guideline reviews the evidence for the treatment of patients with heart failure within acute care settings; however, if we are to successfully lower morbidity and mortality from heart failure, then a co-ordinated approach across the healthcare spectrum is essential. This new guideline complements NICE CG108 on Management of chronic heart failure,3 and the new recommendations on acute heart failure are important reading for GPs. NICE Clinical Guideline 187 on Acute heart failure: diagnosing and managing acute heart failure in adults has been awarded the NICE Accreditation Mark. a follow-up clinical assessment within 2 weeks of discharge. Ensure that all people being admitted to hospital with suspected acute heart failure have early and continuing input from a dedicated specialist heart failure team. In people presenting with new suspected acute heart failure, consider performing transthoracic Doppler 2D echocardiography within 48 hours of admission to guide early specialist management. Offer an angiotensin converting enzyme inhibitor (or angiotensin receptor blocker if there are intolerable side effects) and an aldosterone antagonist during hospital admission to people with acute heart failure and reduced left ventricular ejection fraction. If the angiotensin converting enzyme inhibitor (or angiotensin receptor blocker) is not tolerated, an aldosterone antagonist should still be offered. NICE (2015). 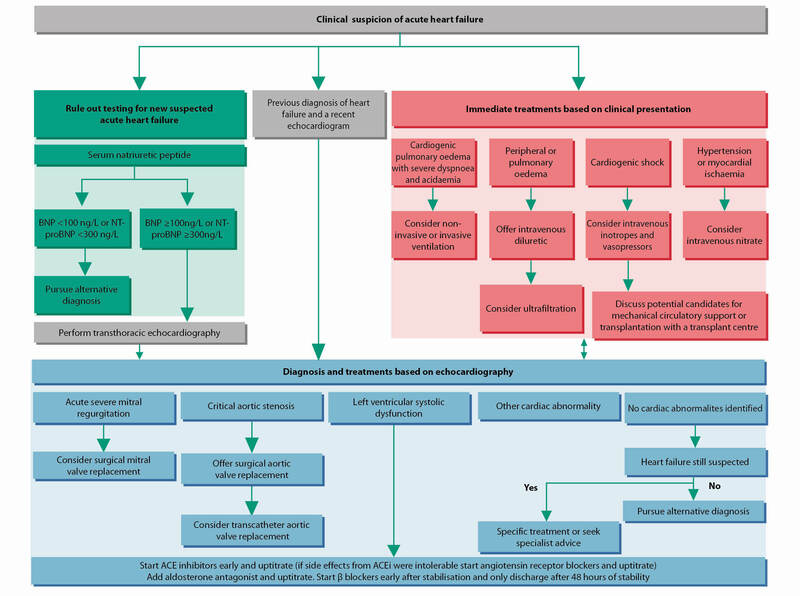 Acute heart failure: diagnosing and managing acute heart failure in adults. Clinical Guideline 187. Available at: www.nice.org.uk/guidance/CG187 Reproduced with permission. ACE=angiotensin-converting enzyme; BNP=B-type natriuretic peptide; NT-proBNP=N-terminal pro-B-type natriuretic peptide. Reproduced from BMJ 2014; 349: g5695 doi: 10.1136/bmj.g5695 with permission. In order to prevent recurrent admission and improve long-term prognosis, it is necessary to try to optimise evidence-based medical treatments. For people with heart failure associated with left ventricular systolic dysfunction, better outcomes are apparent in those who receive an angiotensin-converting enzyme inhibitor (ACE-I), a beta blocker (BB), and an aldosterone antagonist (AA), with the combination leading to reduced morbidity and improved life expectancy.1 During the hospital admission and in the absence of contraindications, an ACE-I, BB, and AA should be commenced and at least the initial dose titration started. There is a small risk of further decompensation following BB use, so a period of stability should be ensured prior to discharge (48 hours has been suggested).1,2 In general, if a patient is already receiving a BB and is admitted for an acute decompensation, there is no need to stop it unless they have a heart rate less than 50 beats per minute, second- or third-degree atrioventricular block, or shock. In-patient and subsequent out-patient monitoring of a person's renal function, electrolytes, heart rate, blood pressure, and overall clinical status will be needed2 (see also NICE CG1083). NICE CG187 recommends a number of organisational and structural changes to the care or treatment of a patient with heart failure.2 The provision of a specialist heart failure team, routine serum natriuretic peptide testing, and echocardiography within 48 hours is likely to require some resource redistribution that may not be welcome in a cost-constrained environment; however, downstream benefits will be realised. At an individual level, practice may need to change, as the guideline no longer recommends routinely using opiates, nitrates, and non-invasive ventilation for people with cardiogenic pulmonary oedema. Implicit throughout the guideline is the change in attitude required as well; morbidity and mortality due to heart failure are too high, and therefore changes at individual and organisational level are needed in order to focus on acute heart failure. This type of change may be slowest, but could be significantly assisted by financial initiatives such as the proposed national Best Practice Tariff for heart failure6 or other measures developed locally by commissioners. Some useful sources of information for patients, families, and carers can be found in Box 3, below; links to information to aid implementation of NICE CG187 can be found in the 'NICE implementation tools' below. British Heart Foundation website. Heart failure. Heartfailurematters.org website. Practical information for patients, families and caregivers. NICE has developed the following tools to support implementation of Clinical Guideline 187 (CG187) on Acute heart failure. The new NICE guideline on acute heart failure recommends significant changes in the structure of care and standard treatment of patients with acute heart failure. Implementation of these changes is likely to improve quality of life and reduce re-hospitalisation and mortality rates for people with heart failure. An initial increase in expenditure required to apply the guidelines will be offset by reduced downstream costs. Follow up with a member of the specialist heart failure team should occur within 2 weeks of discharge.